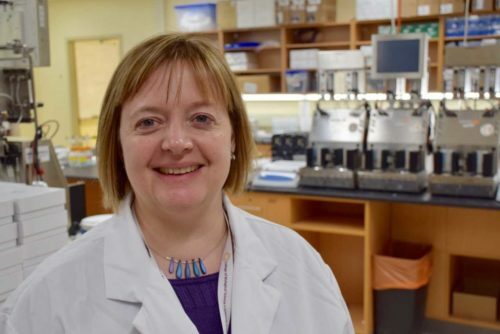 A University of Guelph microbiologist is part of an international research team receiving a $25-million award under the world’s most ambitious cancer research grant. Prof. Emma Allen-Vercoe, Department of Molecular and Cellular Biology, is among 14 researchers from five countries on a research team looking to study connections between microbes in the body and cancer. Her expertise in culturing gut microbes developed in her U of G lab – and its custom-designed “robo-gut” mimicking the workings of the large intestine — led the team’s principal investigators to invite her to join the project. The team, called OPTIMISTICC (Opportunity to Investigate the Microbiome’s Impact on Science and Treatment in Colorectal Cancer), was chosen today to receive funding from Cancer Research UK based in London, England. The group was one of three teams supported in the current funding round from 134 submissions involving some 40 countries. Under its Grand Challenge competition launched in 2015, the agency intends to assemble interdisciplinary teams of scientists in cancer research. OPTIMISTICC is the seventh international team funded under the initiative. Allen-Vercoe has gained international recognition for her studies of the gut microbiome and its importance in human health and disease. She has developed a potential treatment for C. difficile infection and has studied colorectal cancer, diabetes and illnesses in preterm babies. Scientists know that the microbiome – microbes in the body whose makeup varies from person to person — normally help to maintain health. But those bugs can also play a role in the development of disease, including cancer. Colorectal cancer (CRC) is the third most common cancer diagnosed in both men and women in the United States. Diet and obesity can affect the microbiome and may be important in cancer development. Allen-Vercoe will culture gut microbes from people with and without CRC and study how those microbes influence cancer. She and her team hope to develop ways to treat the microbiome – and even replace a risky microbiome with a healthy one — to counter CRC. Through Nubiyota, a spinoff company she co-founded in 2013, she also plans to conduct a trial of gut microbiome replacement in cancer surgery patients in hopes of preventing disease recurrence.